And bravely they fought, many of them under that Confederate Battle Flag, which flew over General Robert E. Lee’s Army of Northern Virginia until April of 1865, when Lee surrendered to Ulysses Grant at Appomattox, Virginia. Then, for generations following Appomattox, the Confederate Battle Flag appeared at Confederate commemorative events, at veteran reunions, and at gravesites of fallen Confederate soldiers. The flag was used to honor those who fought bravely for the Confederacy. That is the history, flag supporters say, of the Confederate Battle Flag. Perhaps if 1865 had seen the last fight over which the Confederate Battle Flag was flown, it might be plausible to say today that it represents “Heritage not Hate.” Unfortunately for this pro-flag narrative, there is a subsequent chapter in the story of the Confederate Battle Flag. More than 80 years after the end of the Civil War, the Confederate Battle Flag was raised again for a new fight that would last decades: the struggle against integration and civil rights for black Americans. This post-Civil War resurrection of the Confederate Battle Flag began when the States’ Rights Democratic Party, the “Dixiecrats,” seceded from the Democratic Party and nominated Strom Thurmond as its Presidential candidate. At the 1948 Dixiecrat convention, and at rallies and speeches during Strom Thurmond’s campaign, the Confederate Battle Flag flew in large numbers for the first time since 1865. Article 4. We stand for the segregation of the races . . . . We oppose the elimination of segregation, the repeal of miscegenation statutes. . . . Article 5. We oppose and condemn the action of the Democratic Convention in sponsoring a civil rights program calling for the elimination of segregation, social equality by Federal fiat, regulations of private employment practices, voting, and local law enforcement. In 1961, as the civil rights movement was growing, the Confederate Battle Flag reappeared at the state capital building in Columbia, South Carolina, to commemorate the centennial of the start of the Civil War. The issue of integration was omnipresent. Various speakers at the ceremony stood beneath the Confederate Battle Flag and praised South Carolina’s fight against integration and civil rights for black Americans. 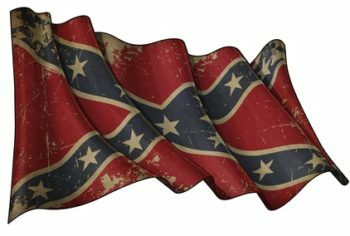 Perhaps it was once possible for the Confederate Battle Flag to mean “Heritage Not Hate.” But starting in 1948 with the Dixiecrats, through the civil rights battles of the 1950s and 1960s, the flag was given a sinister meaning. Both the white people who waved the Confederate Battle Flag, and the black people who watched it being waved, understood what was meant. The flag meant fighting integration and civil rights for black Americans. And that fight against civil rights was woven into the fabric of the Confederate Battle Flag. So today, when people recoil when they see a Confederate Battle Flag, they are not being overly sensitive. It is not excessive “political correctness.” The flag has been irretrievably connected to segregation and Jim Crow. Which makes it long past time to stop waving it, to stop wearing it on T-shirts, to stop flying it behind cars and trucks. It is time to furl the Confederate Battle Flag.